I have two pieces of exciting news. 1) I decided to chop my hair into a lob (slightly longer than a bob), and 2) I got a new job! I’m now working as a a sales professional for French sister brands Sandro & Maje at their concession stores in the Women’s Contemporary department of Bloomingdale’s in Newton, Mass. If you know me or follow the Sauce remotely closely, you know that I’ve been a huge Sandro & Maje fan for a few years now (I actually discovered their stuff while working for a different company at the same Bloomingdale’s location), and it really is so much fun to be able to work with clothing I connect with so deeply in terms of my personal style, and help others style it to their own taste. The thing is, I need my readers to understand that, although I do do some representative work for various brands and companies here on the blog, that is NOT my relationship with Sandro & Maje. While I may wear and write about their merchandise, the views expressed on this blog do not necessarily reflect the views of the company’s management, and so from now on, whenever one of my outfit posts features Sandro and/or Maje merchandise, you’ll see that disclaimer at the bottom of the post, right before the photo credits. “Vintage” Piazza Sempione blazer, Maje ‘Pigou’ velvet pants, Theory turtleneck, Sandro creepers, Stella & Dot necklace, Oliver Peoples sunglasses. One of my favorite things about working at Bloomingdale’s is that employees have to wear all black, and while a lot of people think this must get boring, on days that I’m in a hurry, it’s actually an easy way to get dressed and ensure that I look chic without too much thought; and on days when I feel like making a little more effort, the all-black wardrobe requirement presents an opportunity for me to stretch my creativity as a stylist. 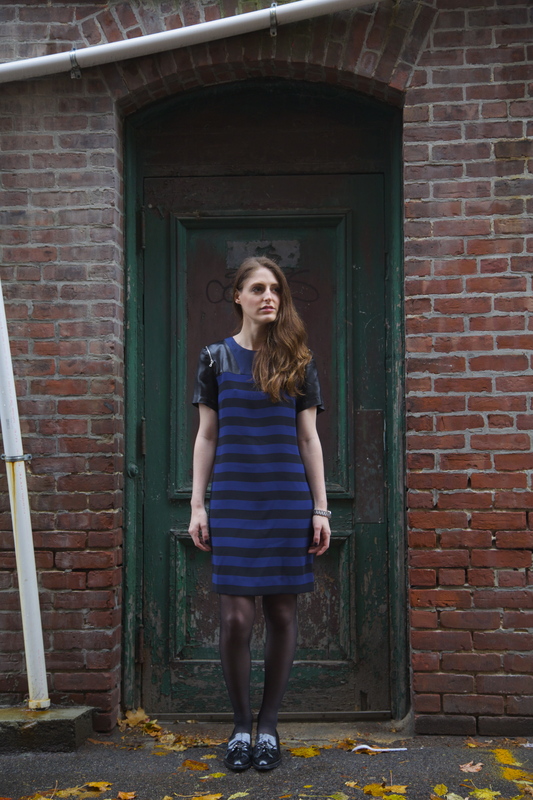 Going for a menswear-as-womenswear look is a cool and edgy approach to wearing all black. 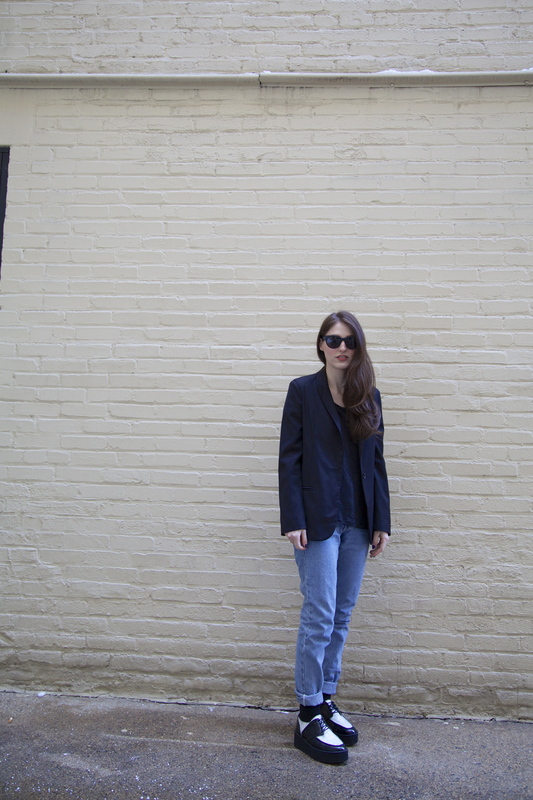 Here, I put my own spin on this style with a blazer that’s cut a little longer than most (thanks, Mom! 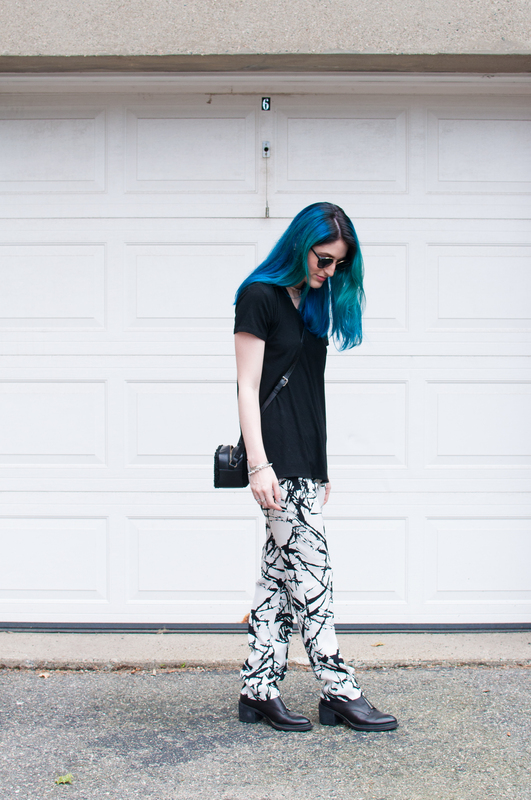 ), velvet trousers, and my beloved creepers. Velvet is so luxe and beautiful, and I think creepers are one of the most delightfully androgynous trends. To make my gender-bending outfit as sleek as possible, I stick with simple silver jewelry and pull my hair into a side-parted pony. Someone on Instagram pointed out that this whole look is reminiscent of Karl Lagerfeld’s signature style, but I swear I’ve been dressing this way since long before I dyed my hair gray. That being said, I certainly don’t mind the comparison one bit. 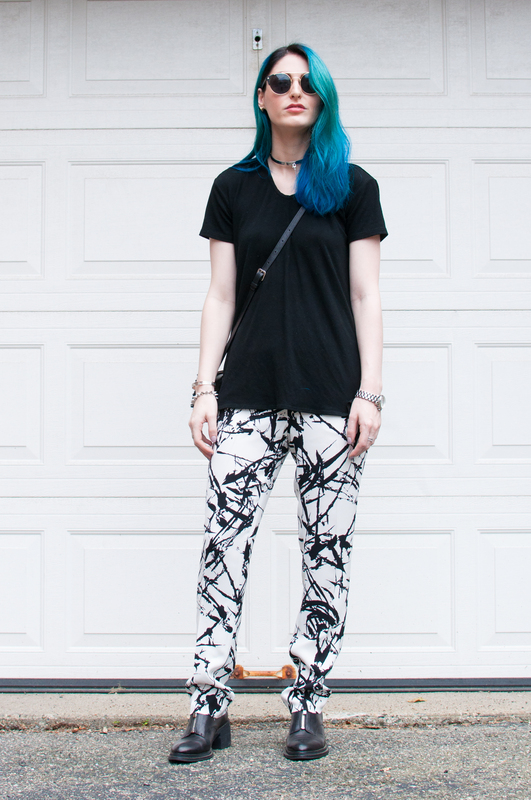 ALC pants, Theory top, Jeffrey Campbell ‘Stoppard’ shoes, Sandro bag, Eddie Borgo jewelry. I’ve desperately wanted what social media has deemed “mermaid hair” for about five years now. Though I might tear my hair out entirely if one more person asks me “why” I’ve decided to dye it blue (just think really carefully for a second…that’s it! You got it—because I like it…), I am willing to answer a much more important question: why did I wait so long? As someone who adamantly believes that we should all style ourselves for ourselves—and kindly assume that that’s “why” anyone makes the sartorial choices they make—I’m a little embarrassed to admit that I let other people’s opinions postpone this change, even though I knew my desire was real. I dare not compare myself to Caitlyn Jenner, but the message her transformation sends applies to all of us: if you don’t live as your true self, you’ll live with regrets. I’m not saying I’m actually a mermaid on the inside, or that I want blue hair for the rest of my life, but I do believe if I hadn’t seized this opportunity just because a few people I love and respect didn’t love the idea, I’d have lost respect for myself. In the week leading up to my hair appointment, the most popular question I received besides “why?” was, “Are you worried it will be harder to get dressed?” Well, not really, no. Even blondes and brunettes have to take their coloring into account when choosing clothes. I think because society still associates brightly colored hair with rebellious counter-cultures, people assume that I’ll have to push my always-eclectic style into one specific, radical corner in order to cater to this extreme hairstyle. Challenge accepted! Although I definitely do intend to dip into those more radical styles colorful hair commonly brings to mind, For however long I have blue hair, I’ll also aim to prove to my readers and followers that they can still relate to my style and draw inspiration from my looks, even if a head of blue hair is something they’d never consider. Let’s start with the outfit above. I won’t let anyone tell me it couldn’t be worn by someone with “normal” hair, because I’ve rocked this look as both a blonde and brunette, as well. 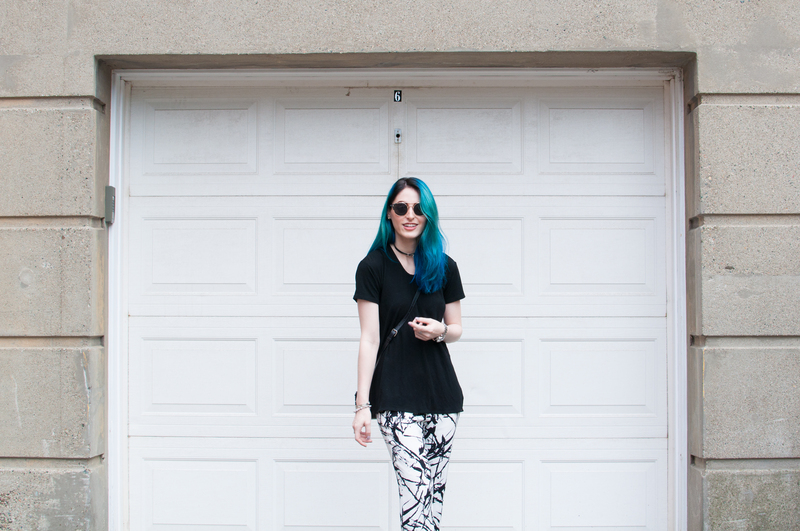 For a chic daytime look, I’ve styled these sleek but funky pants with menswear-inspired shoes and an oversized tee. To transition to nighttime, I’d swap in a white tank and minimal black sandals, like the fabulous pair I just got at Joie. Hair color by Ashley Seal of Stilisti Salon. Striped chiffon blouse from Nasty Gal, American Apparel black chiffon camisole, trousers from Urban Outfitters, Maje pumps, vintage Chanel cross body bag. Though some might call it impractical, the micro mini purse is a simple accessory that can add a hint of feminine flair to menswear/tuxedo-inspired evening looks. Opt for fabrics like chiffon and touches of lace to create even more contrast. Proper size and fit are crucial elements of style. It’s never OK to wear clothes that are too small, but oversized pieces can take a simple outfit to a more dynamic place. 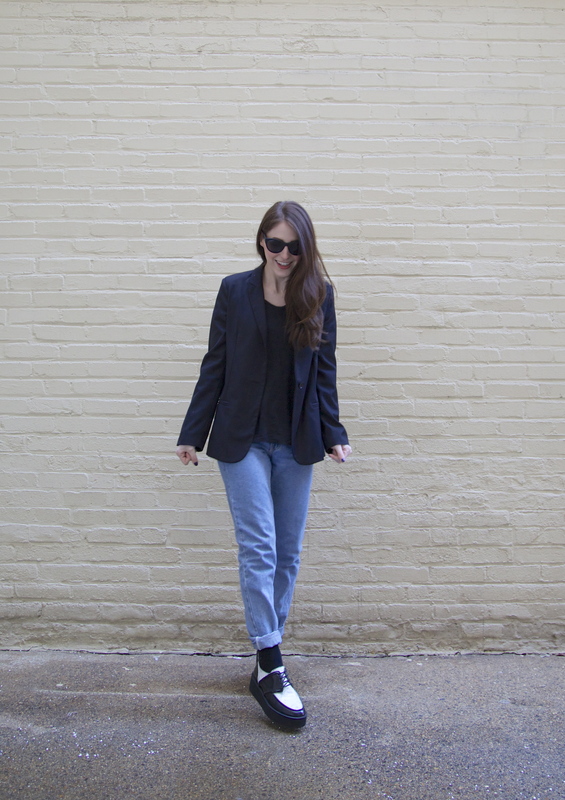 Boyfriend blazer from LF Stores, Sandro tee, American Apparel jeans & socks, Sandro creepers, Oliver Peoples sunglasses: this is my go-to look lately; it’s comfortable, and the tomboy sizing (and admittedly clown-like shoes) brings a bit of eccentricity to such basic pieces. Sometimes I swap this footwear for a striped sock and my plain black platform sneakers. Menswear-inspired coats and shoes + feminine frocks + black & blue, the ultimate color combination of the season = an easy, yet unexpected and stylish look. And Sandro, my current go-to designer, has the equation all figured out. 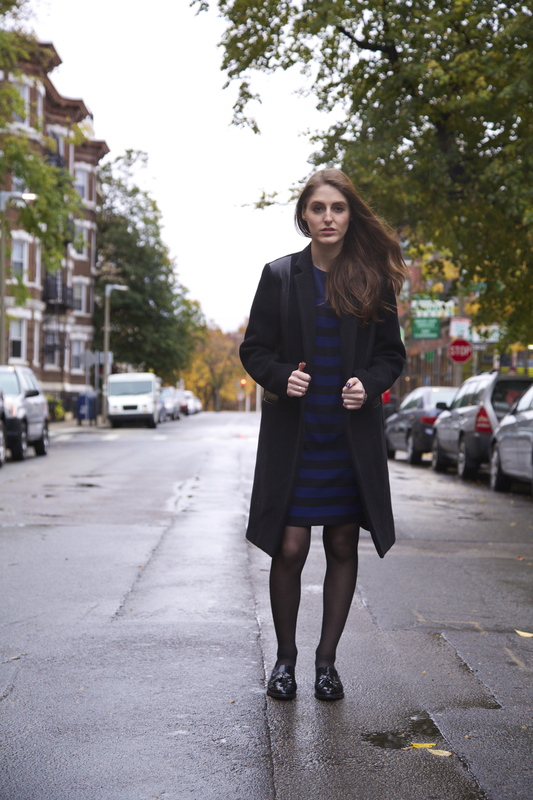 (Please excuse my mean muggin’…) Here I am in a masculine Sandro coat with leather panels, a striped Sandro shift dress, and my Boutique 9 patent-leather tasseled loafers. The contrast between the boyish coat & shoes and the girly dress creates a look that works for day or night. 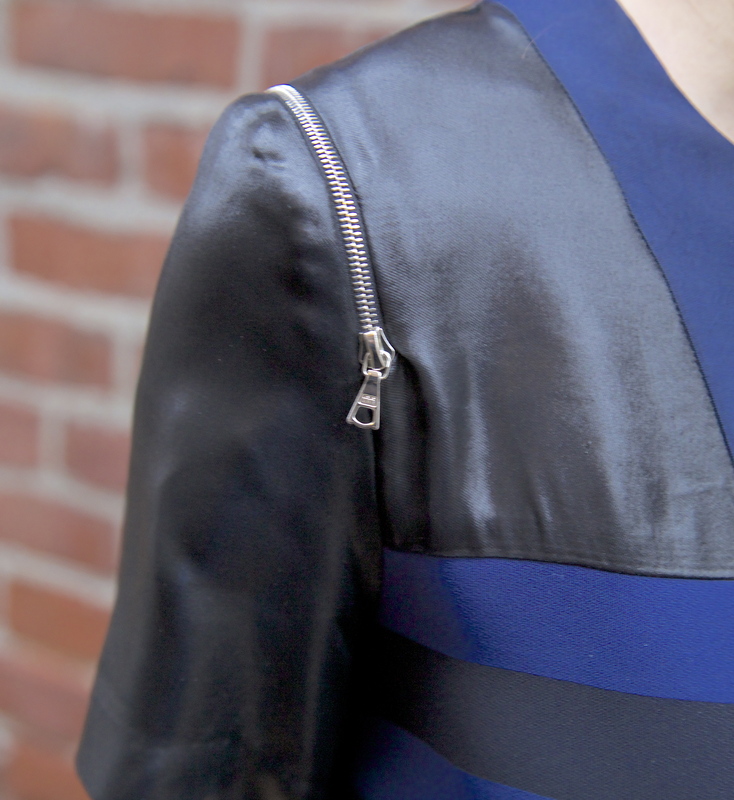 That’s not leather—I’m not sure what effect they’re using on the sleeve here, but it’s pretty awesome. That and the zipper detailing brings an updated edge to the classic shift dress, and essentially eliminates the need for accessories. This particular post/outfit actually speaks to the essay I posted previously. Although people are prone to suggest that fashion objectifies women and promotes gender stereotypes, real fashion (“couture,” if you will…even though you can’t without sounding pompous) constantly embraces androgyny.